Camon Selfie King and Queen #ClearSelfieContest Competition: TECNO is in search of selfie King and Queen for their latest Camon X smartphone. Are you beautiful/handsome enough to model the 24MP Clear Selfie smartphone? This is the chance you have been waiting for! STEP 1 –Take a creative clear selfie. 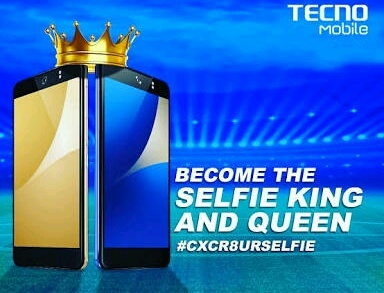 STEP 2 –Upload on either Facebook, Twitter, Instagram or on our TECNO Spot Forum (as a comment under this post) with hashtags #CamonXClearSelfie and #ClearSelfieContest, don’t forget to mention @tecnomobileng. STEP 3 –Ask your friends to like, share/retweet your entry to increase your chances of winning. Each week, 10 most qualified clear selfie pictures determined by our panel of judges will be selected and rewarded with gift items. The top 10 entries weekly automatically qualify for the final stage. At the end of the 4th week, all selected 40 selfie images will be made into a GIF and people will be asked to vote their favorite Selfie King and Queen. Voting runs for 1 week from Friday, 11th May – Thursday, 17th May. To qualify for the top 10 – your selfie has to be clear, sharp and creative. Activity runs from 9th April – 8th May, 2018. Winners will be models for our Camon X smartphone and will go for a 2-day photoshoot. On this note, they agree for their pictures to be used by TECNO Mobile Limited for any advertising content, both online and offline. STEP 1 – Take a creative clear selfie. STEP 2 – Upload on either Facebook, Twitter, Instagram or on our TECNO Spot Forum with hashtags #CamonXClearSelfie and #ClearSelfieContest, don’t forget to mention @tecnomobileng and the name of your SCHOOL. NOTE: You must be our Social Media page(s) to make your entries valid. STEP 3 – Ask your friends to like, share/retweet your entry to increase your chances of winning Selfie King and Queen for your campus. By participating in any of our competitions, entrants agree to be bound by the rules set out below (which may be amended or varied at any time without notice). The responsibility is on participants to acquaint themselves periodically with the rules/terms. a)#ClearSelfieContest Activity is open to everyone who is a legal citizen of the Federal Republic of Nigeria. b) This activity commences on 9th April. 2018 and closes on 8th May, 2018. All entries must be completed no later than 11:59pm on May 8th, 2018. No entry received after this time will be considered. c) TECNO Mobile Nigeria reserves the right to select winners and disqualify erring participants. d) Winners must possess a valid form of identification which includes, but not limited to, International Passport (compulsory for prizes involving international travel), Drivers’ License, and the National ID card. e) Winners agree to co-operate with TECNO Mobile Nigeria in any post-event publicity where they may be required to appear on television or radio, or in printed and online publications, for which no fee will be payable. f) TECNO Mobile Nigeria will not divulge the database of entries received to any 3rd party except in litigation. g) TECNO Mobile Nigeria reserves the legal right, at any time, to verify the validity of any part of an entry and participant (including a participant’s identity, age and place of residence, authenticity of activity) and to disqualify any participant who submits an entry that is not in accordance with these Terms and Conditions or who cheats during the entry process. Failure by TECNO Mobile Nigeria to enforce any of its rights at any stage does not constitute a waiver of those rights. h) Except for any liability that cannot be excluded by law and except as stated in these Terms and Conditions, TECNO Mobile Nigeria (including its officers, employees and agents) excludes all liability (including negligence), for any personal injury; or any loss or damage (including loss of opportunity). i) Employees of TECNO Mobile Nigeria online (or any of its group companies or affiliates/sponsors), or anyone associated with this cause cannot participate in this activity.